ZIPBAR IS A COMBINATION OF DESIGN, MANUFACTURING AND EVENTS & LEISURE INDUSTRY EXPERIENCE. In 2009, having worked in the events/leisure industry for over 15 years, I founded Zipbar and Stainless Fabs Ltd, a bespoke high end stainless steel fabrication company, identified the need for a durable, transportable and professional portable bar system. “Zipbar is a durable, transportable and professional portable bar system that works in any environment." Zipbar's portable bar system was successfully tried and tested at Glastonbury Music Festival, The Royal Cornwall Show by SW Bars Ltd and various student union balls; and on the back of this success Zhev decided it was time to develop a brand and launch Zipbar nationwide. Developing the curved Zipbar sections or "Arc" completed the versatility of Zipbar and enabled it to be built into round portable bars, internal corner and external corner set ups. The Zipbar ethos is based on Zhev’s original idea that temporary events should not look like temporary set ups and that any company using the Zipbar system would have the highest profile and working environment for their staff. 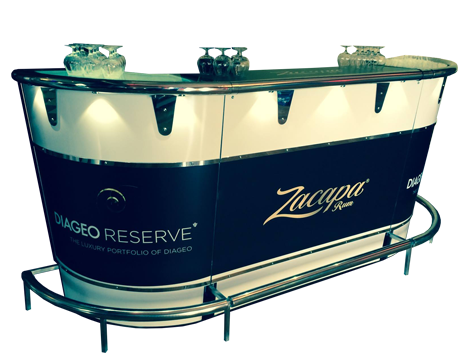 At Zipbar we understand the importance of providing not just a product but a complete service that looks after you from the moment you click on our website, right through to your periodic portable bar overhaul. The Zipbar portable bar build concept was then launched into the industry. 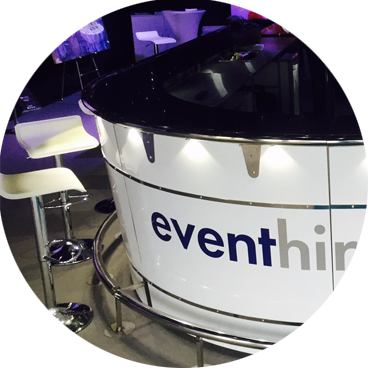 Zipbar quickly got snapped up by event logistic companies such as Coolshock Events, BTI Engineering and ES Global. These companies have used the Zipbar system in the London 2012 Olympics and with major brands such as Diageo, Heineken, Jägermeister and the Guinness Foundry. Zipbar is your complete portable bar system, built and designed from the ground up to be flexible, extendable and stylish. Building slick contemporary, efficient bars has never been this simple. Whether you are interested in buying 1 section of Zipbar or twenty, Zipbar's aim is to respond quickly and efficiently to your company needs. © 2018 Zipbar Portable Bar Systems.